In Germany, UFOP reports that between January and September 2017, biodiesel exports climbed around 11% to 1.16 million tons. Just about 94% were shipped to EU-28 countries. This was up 16% from the previous year. 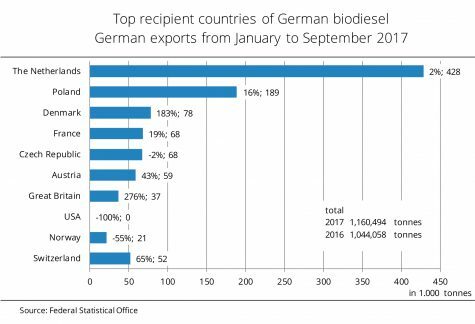 The biggest recipient of German biodiesel was the Netherlands with imports seeing a 1.5% rise to 428,000 million tons. Demand from Poland continued to climb strongly. Taking 189,000 million tons, the country was the second largest purchaser. According to information published by AMI, many other EU countries also raised their imports from Germany. Denmark boosted its imports 183 per cent to 78,146 tons, outstripping France to move to third place. Exports to Great Britain were particularly dynamic, rocketing 276 per cent. France, Austria and Switzerland also imported clearly more biodiesel than in the same period a year earlier. By contrast, exports to the US continued to decline, falling 99.7 per cent to 89 tons. The reasons were the country’s political focus on domestic production from soybean oil and the firm euro that drove up prices for EU commodities in non-euro countries. Norway’s orders for biodiesel dropped on average 55 per cent in terms of quantity.